Nothing says Christmas to me quite like walking into a candy store and buying a box of peanut brittle. The sweet, hard caramel surrounding crunchy peanuts is a real treat! Christmas is such a busy time of the year, and most homemakers spend a lot more time in the kitchen than normal. Having a microwave version of a traditional holiday classic sweet treat saves time and tastes just as good as the stove part recipes do. For a decadent touch, try dipping the peanut brittle pieces into melted dark chocolate. Your party guest will love this version! There are lots of recipes for making peanut brittle at home, but most of them need a candy thermometer or have a water drop step as part of the instructions. The difference with this recipe is that the brittle is made in the microwave, not on the stove top, so there is no need for the old fashioned water drop method, that I must admit I do not care for. Soft ball? Hard ball? I never seem to get it just right. I like the taste of dry roasted peanuts, so I used them in this recipe, but really any sort of nut that is your favorite will work as well. 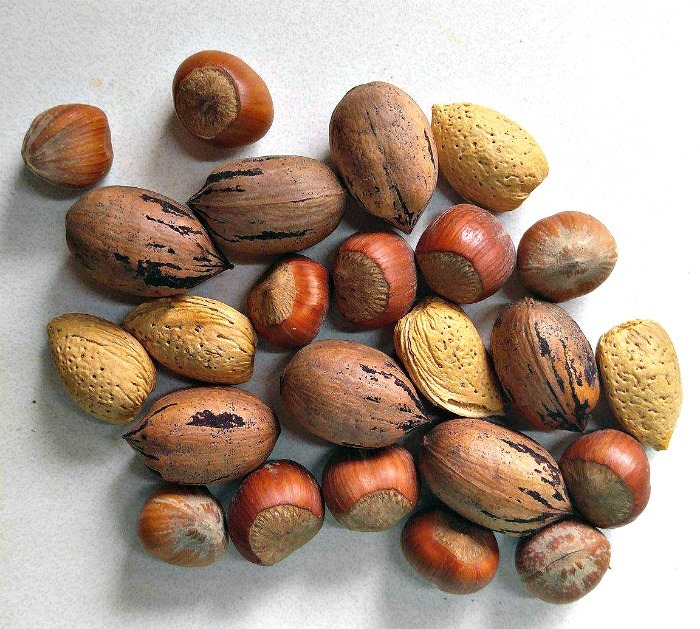 The recipe is faster with shelled nuts but whole nuts give a fresher taste, so they could be used, too. Raw peanuts can also be used, but they normally have no salt, so extra salt (or salted butter) would be great additions to the recipe. One of the great things about making this homemade nut brittle in the microwave is how quickly it comes together. 20 minutes and you are ready to let it harden! Start by heating the sugar and corn syrup in the microwave for 3 1/2 to 5 minutes. I give it all a good stir after the first 2 minutes. Mix in the peanuts and continue heating for another 2-4 minutes. The mixture will get a golden brown color and you know that it’s just about ready. Add the butter and vanilla and cook for another minute. The last step is to stir in the baking soda. You’ll be surprised to see the whole thing foam with this step. Spread the mixture onto a large baking sheet lined with a silicone baking mat or parchment paper, and let it harden. 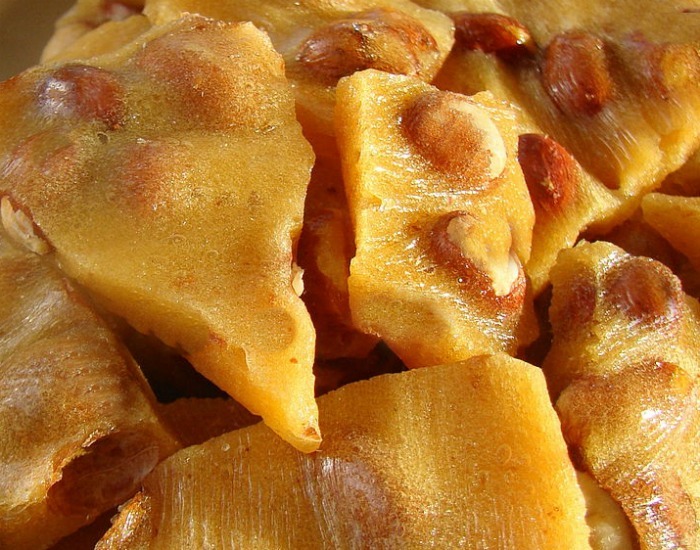 Once the homemade nut brittle has hardened, break it into pieces. 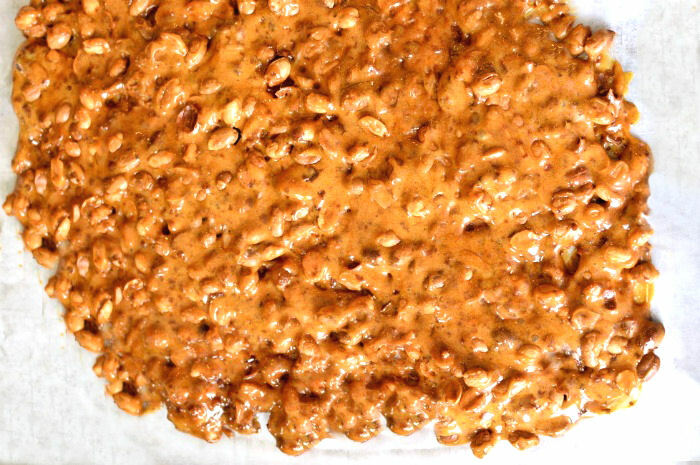 This is the best microwave peanut brittle recipe ever! The recipe for homemade microwave peanut brittle has so much going for it. It’s sweet and crunchy and salty – everything a good nut brittle should be! This microwave peanut brittle makes a great Christmas gift too. Just line a pretty festive box with holiday tissue paper and add the brittle. Your friends will love both the brittle and your thoughtfulness. The mixture makes about 1 pound of peanut brittle. This microwave Peanut Brittle recipe is a really easy and simple recipe that comes together in 30 minutes with no fuss. Your party guests will think you spent all day working on it! Wrap some in colorful plastic wrap with pretty ribbon for quests to take home. Be sure to attach the recipe. They will want it, for sure. Why is my microwave peanut brittle chewy? If you find that the texture of your peanut brittle is chewy and not crisp and firm, the reason is most likely that you didn’t cook it long enough. Even in the microwave, the peanut brittle has to reach the hard crack stage, so that the sugar strands will break easily and not feel sticky. The next time you make it, cook it for a little longer. Microwaves vary a great deal as to how long to cook sugar. Start with less minutes than I ask for and heat in increments. It is easy to burn if your microwave heats more quickly than mine does. Would you like a reminder of this recipe for microwave peanut brittle? Just pin this image to one of your cooking boards on Pinterest. 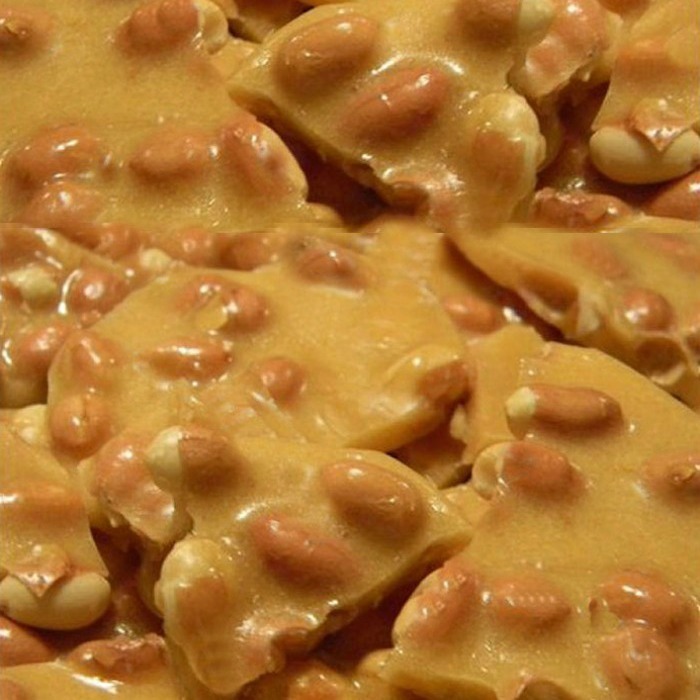 Admin note: This post for homemade nut brittle first appeared on the blog in November of 2013. The post has been updated with new photos, nutritional information and a video for you to enjoy. This microwave peanut brittle is simple to make but looks like you made a trip to the candy shop. 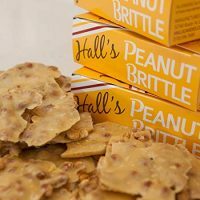 Homemade nut brittle is a favorite of ours at the holidays. 1 1/2 cups of dry roasted peanuts (other nuts such as almonds, macadamia nuts, pecans, or hazelnuts will work too.) I used the salted dry roasted peanuts. 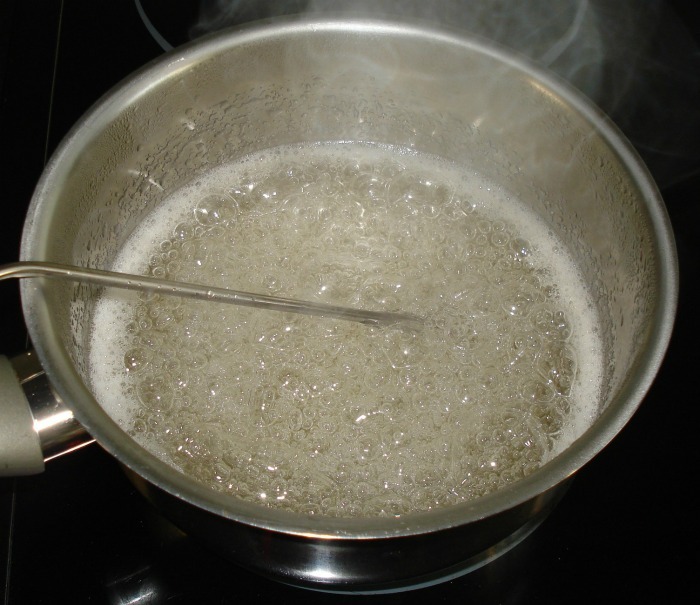 Heat the sugar and the corn syrup in the microwave on high for 3 1/2-5 minutes, stirring after the first 2 minutes. Add the peanuts and continue heating for another 2-4 minutes until the mixture is a golden brown color. Add the butter and vanilla. Stir until the butter is melted and microwave another minute. Spread the mixture onto a large baking sheet. Cool completely and then break into pieces. Please note: microwaves vary a great deal as to how long to cook sugar. Start with less minutes than I ask for and heat in increments. It is easy to burn if your microwave heats more quickly than mine does. The range of cooking times that I give is for microwaves in the 900-1100 power range. The shaved coconut was our own addition. Try it! Thank u for this recipe just made it. Best and easiest peanut brittle I have had in a long time!! First time making peanut brittle and it was easy! Used pecans. Great! Glad you like the recipe Eugenia! Hi Terry. I am sorry to hear that this happened. When I cooked mine it turned out fine. Microwaves to vary a great deal as to how long things cook. I’ll update my directions so that readers won’t have this happen to them. Thanks for letting me know. I have been making a version of this recipe for years with 3 different (1000 watt) microwaves with perfect results. Measurements are the same with the addition of 1/2 t. salt with the peanuts. Cook times are, sugar & syrup for 3 1/2 min, add peanuts and cook another 2 1/2 min. add butter & cook for another minute. Add sofa & pour into pan. On the first microwave round, with only the sugar and syrup, when your heating for 3 1/2 minuets, do you stop and stir after 2 minuets like she says in the recipe? 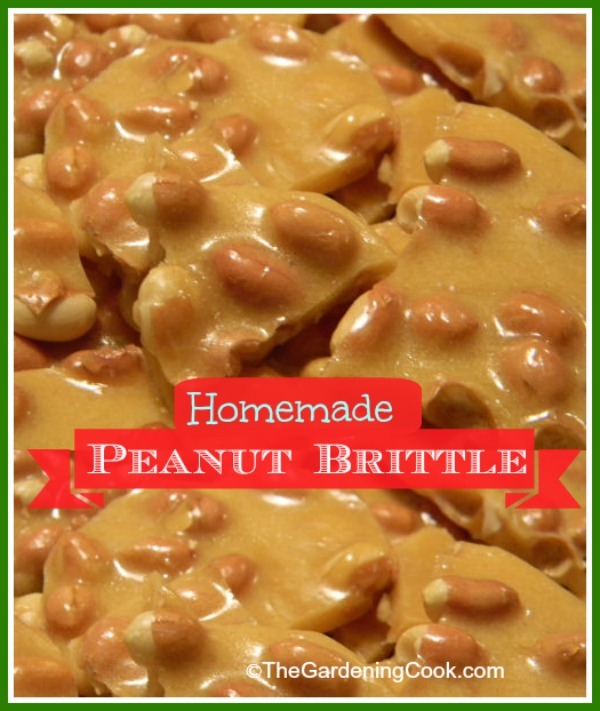 This brittle is perfect & I promise you it’s very quick & easy! I’ve made this (or similar) for a few years, & the only suggestions I would make are: 1. REALLY grease your pan beforehand with butter (makes it a lot easier to get out). 2. Make sure you have all your ingredients PREMEASURED & close to hand, (you’ll thank me later!) 3. Use a large GLASS bowl to heat your ingredients. My first time making this I used a plastic bowl & the bowl MELTED!!! A waste of ingredients & a real mess to clean up. 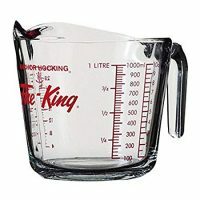 ( I personally use a 2 qt.- size measuring cup. These are only suggestions, the REAL praise goes to CAROL & THE GARDENING COOK!!! ? This was simple to make and tasted amazing!!! I always use parchment paper for candy making instead of butter- personal preference. It’s easy cleanup and the candy doesn’t get the greasy bottom. This is a great recipe and I’ve been making it for years. You have to work so fast .. So easy and tastes great! Thanks! Thank you so much. We use an 1100 watt and used 3 1/2 on the first then 3 on the peanuts and 1 on the butter and Vanilla. I loved the way it foamed up I was like a kid. This is the easiest we tried the old fashion way it id did not taste good. My husband said it taste like I bought it at an old time candy store. We use an 1200 watt microwave not sure how long to cook it with that wattage. Carol could you address my question please. Hi Linda, I can’t say for sure sine my oven is a bit lower than yours. 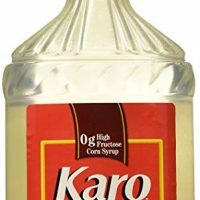 I”d try it at 3 minutes for the first step with sugar and corn syrup and then maybe 1 1/2 minutes for the second with the peanuts and 30 seconds for the third step with the vanilla and butter. peanuts like regular recipes call for? I just want to express my gratitude for this recipe. I have been using it for the last 5 years now and my dad requests it for his birthday, Christmas, and fathers day- it’s his absolute favorite and I always catch other members of my family sneaking into his stash. Thank you! I have been making microwave peanut brittle for several years. This year it came out too hard, not crunchy. What causes it to be too hard vs crunchy? I tried several changes, but to no avail. Just tried this recipe and it came out great! Delicious and so easy to make in the microwave!